Hello, fellow Bourbon Evangelists! We’re back with a little something new for you. Sort of like our version of the Fireside Chat, we bring you the first Around the Barrel cast! In an effort to record more often and get information to you in a more timely manner, we’ve decided to start doing some casts in-between our large historical and scientific pieces. These will include news, events, bourbon reviews, commentary on the bourbon world, and anything else we get into while sippin’ around the barrel. We hope that this way we will have more time for our larger research pieces, as well as allow more time to rant quixotically about news, reviews, and miscellaneous bourbon culture. Let us know what you think in the comments, or on our Facebook and Twitter feeds! Herein we talk about upcoming events, new releases, our coverage of the Bourbon Classic, the bourbon boom, non-distiller producers, and review some high-proof bourbons. 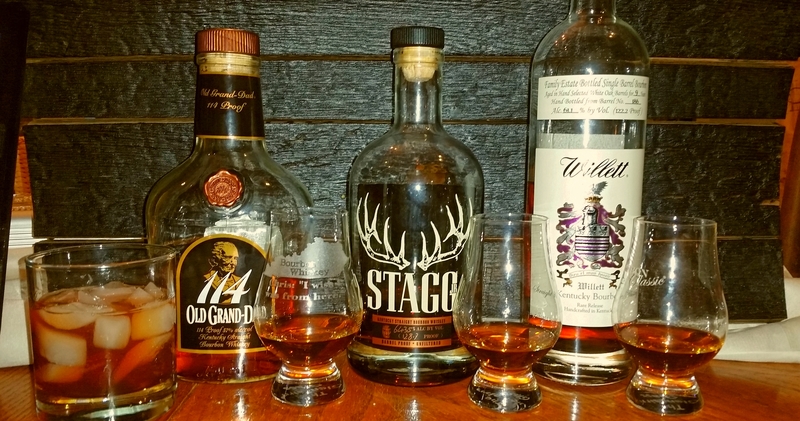 For those of you playing at home, we review Old Grand Dad 114 Proof, Stagg Jr., and Willett 9 Year single barrel with some surprising results. Cheers! Maraschino Cherry Recipe – We recommend adding less Luxardo, some orange zest and about 1 tsp almond extract.